This tour resumes in April 2019. Exclusive bespoke tours to these and other locations are available all year round for groups of more than 16 adults. This unique tour runs from Bath on selected Saturdays at 0900, returning around 1700, visiting Stonehenge and Salisbury Cathedral with the Magna Carta, and the medieval city of Salisbury. This is a full day tour packed with fascination and enjoyment. The route chosen is scenic and historical and will be fully guided by your professional guide. The price includes an entrance donation for Salisbury Cathedral and a guided tour. The price also includes a guided walking tour of the medieval city of Salisbury. At Salisbury Cathedral you will see the tallest spire in Britain and also walk through the largest medieval close in Britain. The cathedral is home to the finest of the four surviving original Magna Carta from the year 1215. Our first stop is the World Heritage Site Stonehenge. From the new Visitor Centre, you will be transported about 1.3 miles by shuttle bus, to the mysterious prehistoric monument that is Stonehenge. You will be provided with an audio guide that is available in many languages. Salisbury Cathedral, with its soaring spire, Britain's tallest 123m/404ft, is surrounded by a large and beautiful medieval close. It has the earliest surviving complete choir stalls in Britain, and the largest cloisters, and a medieval clock believed to be the oldest working mechanical clock in the world. Salisbury Cathedral is both a living church and an internationally renowned heritage attraction. You will be given a guided tour of the Cathedral. An entrance donation is included in the tour price. The Magna Carta The Cathedral has the finest original copy of the 1215 Magna Carta, on permanent display in the Chapter House. The tour includes an additional guided walking tour of the Cathedral Close and the medieval city of Salisbury. As our tours are competitively priced we are unable to offer discounts for students and seniors. A limited number of seats for 3 to 5 year children are available please contact us for information. If you are a member of English Heritage, or the UK National Trust, or you have prepaid tickets for Stonehenge please contact us with your card or ticket number for an alternative discounted price for this tour. This fully guided coach tour runs from Bath on the dates shown below at 1045, visiting Lacock National Trust Village, Avebury and Stonehenge, and returns to Bath around 1830. This is a full day tour packed with fascination and enjoyment. The route chosen is scenic and historical and will be fully guided by your professional guide. Firstly we visit the historic National Trust Village of Lacock. A short guided walk around Lacock is included in the tour price. Later you might like to take lunch in one of the quaint public houses or tea rooms. You could also visit the beautiful Lacock Abbey but this is not included in the tour cost. Lacock has been the setting for many films such as the Harry Potter films and TV shows including Pride and Prejudice, and Wolf Hall. A market scene from Series 6 Downton Abbey filmed in Lacock. 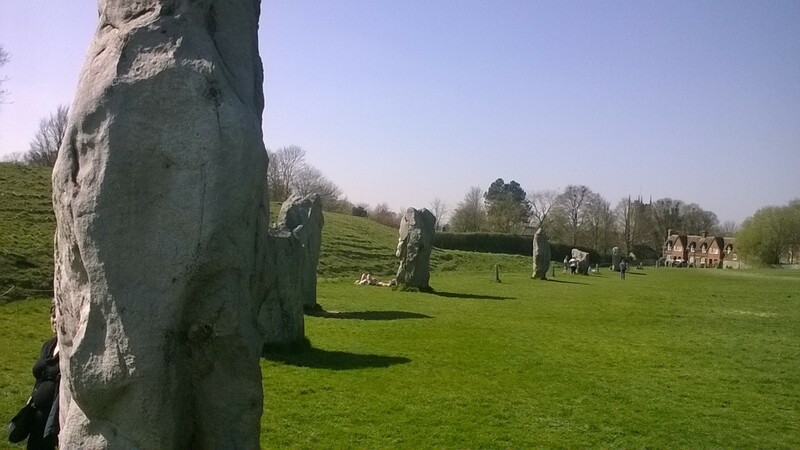 We then travel on to the world heritage site of Avebury, where you can see the vast ancient stone circle and actually touch the standing stones. We then travel on to Stonehenge, where you can see the new visitor centre, and you will be transported about 1.3 miles by shuttle bus to the mysterious prehistoric monument that is Stonehenge. At Stonehenge you will be supplied with a multilingual audio guide that is available in many languages. Wednesday 17 April 2019, Saturday 20 April 2019, Wednesday 1 May 2019, Saturday 4 May 2019, Saturday 25 May 2019, Saturday 8 June 2019, Saturday 22 June 2019, Saturday 6 July 2019, Wednesday 24 July 2019, Saturday 27 Julyl 2019, Wednesday 31 July 2019, Wednesday 14 August 2019, Wednesday 21 August 2019, Saturday 24 August 2019, Wednesday 28 August 2019, Saturday 14th September 2019, Saturday 28th September 2019. Here is a map of the Bath departure point, the front of the Abbey Hotel, North Parade, Bath.BA1 1LF. Please be at the departure point 15 minutes before the stated departure time.